Graham Greene once remarked: "Outside the window an ocean of long undulating grass stretched to a pale green horizon. There was the talkative cheerfulness of journey's end in the air". A journey of thousand miles begins with a single step. The Centre for Tourism & Heritage Research under the auspices of the Department of Commerce, Dayanand College Ajmer, has taken a step forward by launching a new Interdisciplinary International Referred Research Journal - the South Asian Journal of Tourism & Heritage (SAJTH). It is indeed a timely step taken forward by the Center in the field. It is not the journey's end but the beginning of it and thus a talkative cheerfulness is all pervading. 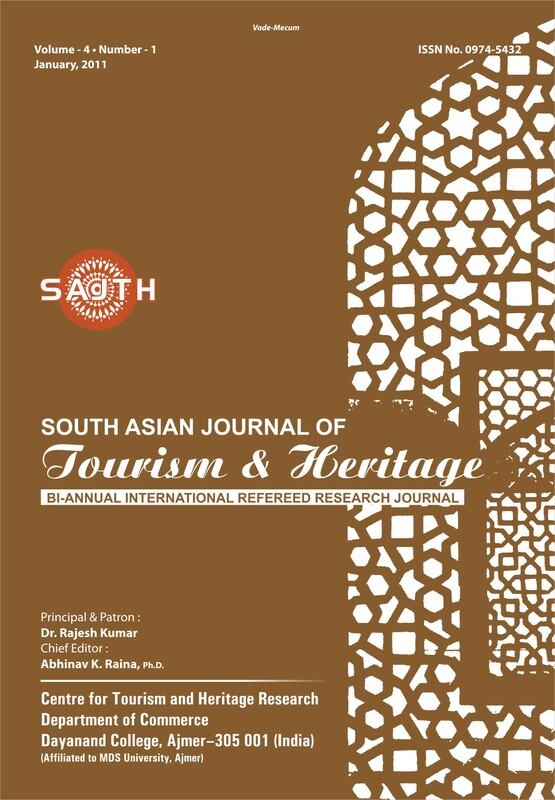 South Asian Journal of Tourism & Heritage (SAJTH) focuses on exploring the many facets of one of the most notable and widespread types of tourism. Tourism & Heritage is among the very oldest forms of travel as such, this form of tourism dominates the industry in many parts of the world and involves millions of people. During the past few decades, the study of tourism has become highly fragmented and specialized into various theme areas, or concentrations. This academic attention has resulted in the publication of hundreds of referred articles in various scholarly media, yet, until now there has been no journal devoted specifically to tourism & heritage issues. Publisher: Centre for Tourism & Heritage Research, Department of Commerce, Dayanand College, Ajmer - INDIA. Previous Issue July 2012 Read the Contents & articles Published in SAJTH 2012 Issue. Previous Issue Jan 2012 Read the Contents & articles Published in SAJTH 2012 Issue. Previous Issue July2011 Read the Contents & articles Published in SAJTH 2011 Issue.
. Previous Issue Jan2011 Read the Contents & articles Published in SAJTH 2011 Issue.